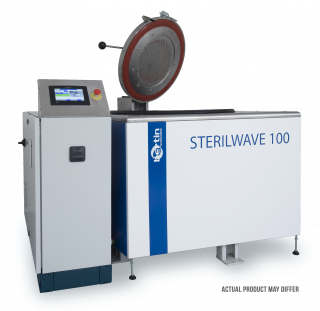 The Sterilwave solution for disinfecting biomedical waste is based on microwave technology, which is the most eco-friendly method available. This technique allows microbial inactivation of biomedical waste in 30 to 35 minutes. 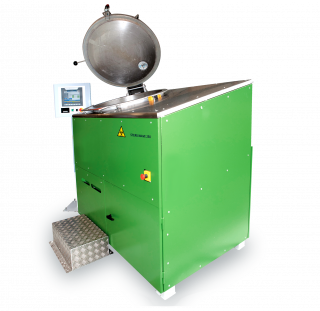 Unlike autoclaves, this process does not require pressurisation, and this minimises any risk of explosion due to poor maintenance and training of operators. All types of biomedical waste (solids, liquids, glass, sharps, blades, etc.) can be treated with the system, and the entire process is traceable. 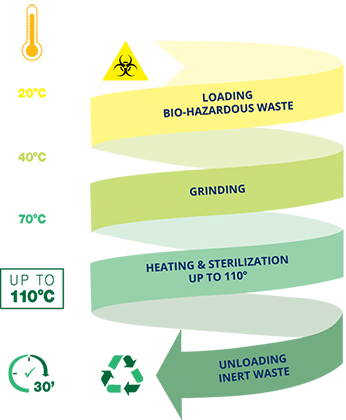 Besides the rapid and effective decontamination of biohazardous waste to an inactivation level greater than 8log10 (sterilisation level), the Sterilwave also converts biomedical waste into dry, inert material and reduces its weight by more than 25% and its volume by 80%. This resulting material is similar to municipal waste and can also be used as secondary fuel with a high energy output. 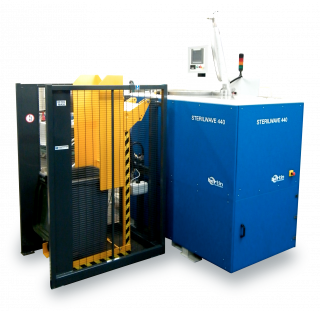 The Sterilwave technology automatically converts infectious waste into municipal waste within its tank and in 30 minutes. As it uses the microwave technology, Sterilwave is the easiest, most efficient and economical solution to manage medical waste onsite.